Kampin Gear has a full-range of hammock camping gear, including a huge hammock, matching rain fly, protective bug net, and webbing straps. I was sent a complete kit to review. The Kampin Gear kit is a mass-market collection that provides really good quality gear at a great price. It’s a great kit to consider if you’re on a budget and want to get the most gear for your investment. The material quality is equal to most mass-market hammocks but there are some subtleties that make the Kampin Gear brand a little better than most. Some of the construction is similar to the ENO brand, including the butterfly cord locks. The Hangeasy Hammock uses the same fabric that you’d see on most gathered-end “parachute nylon” hammocks: 70D/210T crinkle taffeta nylon material. It’s exactly the same fabric and construction you would see with an ENO hammock, but at a lower cost. However, the hammock is MUCH larger, and MUCH more comfortable than an ENO, and includes more features, so my recommendation would be if you are in the market for a an entry-level hammock with all the trimmings, Kampin Gear should be on your short list. The larger sack could also fit an under quilt or top quilt, or other gear depending on how you pack. It’s a great option, almost a “lazy slug tube” for packing hammock gear. The rain fly is also very large and a good match to the hammock. Its dark fabric blocks out the penetrating rays of the sun for better shade than typical silnylon tarps. The included stakes and guyline make this a great value and a good entry level tarp. The guypoint attachments use the popular LineLoc and for the most part this works great. I’ve never found a tarp yet that can hold up 100% on the ridgeline using these connectors, so I recommend tying a slippery half hitch to keep the ridgeline from slipping in high winds or storm conditions. The Refuge Bug Net is basic 360-degree, tube-style mosquito net, very similar to the ENO Guardian Bug net. but the material and craftsmanship has a little different fine-tuning. The YKK zipper runs smooth and holds well in real use. 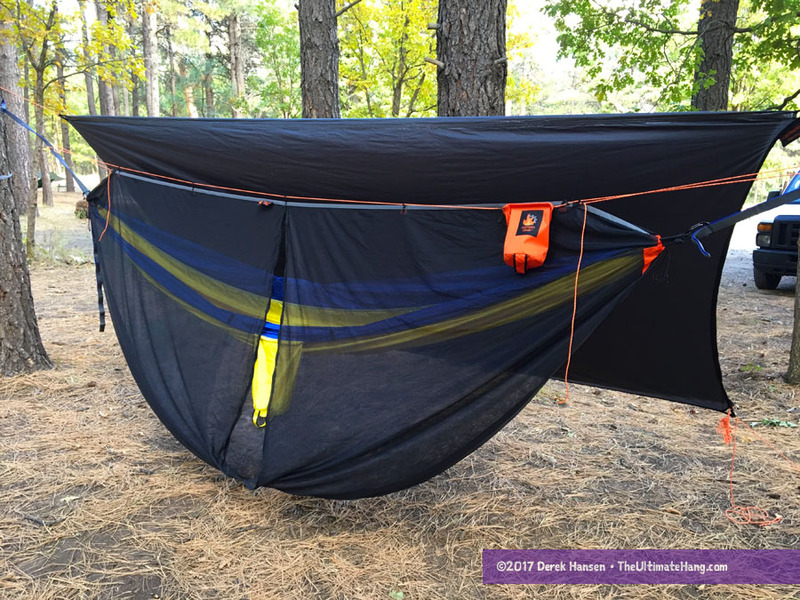 LineLoc fasteners are used on the ends to adjust the tension across the ridgeline, and it has five hooks to keep the bug net above the hammock. The stuff sack is uniquely attached on the end, across the ridgeline. I really like this design because it keeps the sack off the ground (common with other bug nets with this design) so it is easier to access for packing. One of my complaints about nets of this design is that there is nothing to keep the bug net off your body as you lay in the hammock. Since the netting drapes straight down, as you lay in the hammock, either in line or on the diagonal, you will be in direct contact with the netting. Aftermarket side pull outs can really help and I highly recommend getting some if you pick up this net. The main advantage this net has over the competition is the price. For the design and build, this is a great value. I love it when manufacturers include tree straps with their hammocks. This always ranks high in my book and I’m glad Kampin Gear has chosen this option for all their hammocks. The icing on the cake is that they use quality daisy chain straps, thus combining ease-of-use with environmental sustainability. Extra points. I highly recommend daisy chain suspension straps for new hangers, and honestly, they’re great for anyone (I use them often) for no-nonsense hammock use. I use this style of strap whenever I take a lounger hammock out to the park or at work for a break. The straps are actually surprisingly good. at 10.5 feet long and 18 connection points, they offer a lot of length and adjustability. And at only 13 ounces, they are among the lightest straps of this style. The straps can be purchased separately, and at $25, it’s a great deal for a pair of daisy chain straps. Suspension and Anchor System ♥ ♥ ♥ ♥ ♥ The included strap set and carabiners are fantastic. The carabiners are high-quality and a great deal. Construction and Craftsmanship ♥ ♥ ♥ ♥ ♥ Good craftsmanship; straight, even stitching; reinforced; quality materials. Modularity ♥ ♥ ♥ ♥ ♥ Open, gathered-end hammocks are the foundation to a modular system. This kit combines all the features you need to get started. Aesthetics ♥ ♥ ♥ ♥ ♥ I’m not a huge fan of the common three-panel fabric build. The extra flaps of fabric add some color variety, but nothing out of the ordinary. The look is common. Price and Value ♥ ♥ ♥ ♥ ♥ Value priced and a good deal. Previous: Previous post: How does the hang angle affect my hammock?